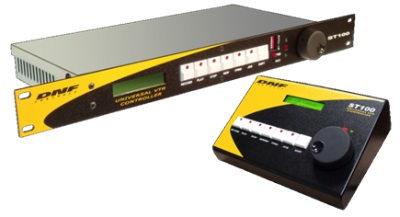 One ST100 Universal VTR Controller controls them all: VTRs, VCRs and DDRs! The ST100 Universal Controller provides low cost control over the wide range of RS422 video record / playback systems in your facility. Simple & Easy to use: there are no complicated menus to search. All the functions you need are at the press of a button. The ST 100 eliminates the need for multiple remote controllers & the associated clutter of several pieces of control hardware. ST100-SXD Table-top VTR Controller offers complete basic machine control with Special XDCAM functionality: Go to first Clip, go to last Clip, go to next Clip, go to previous Clip. ST100-SXD-RK 1-RU rackmount VTR Controller offers complete basic machine control with Special XDCAM functionality: Go to first Clip, go to last Clip, go to next Clip, go to previous Clip.